Chris Prillaman is a lifelong student of the martial arts. He began his training at the age of 15 and has since acquired the rank of black belt in 2 separate disciplines. He continues his training to this day and has been teaching professionally for more than a decade. 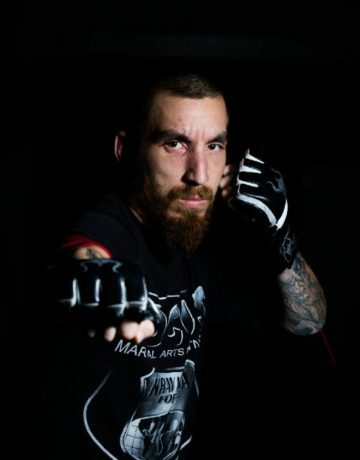 His list of achievements include a first degree black belt in Hapkido, a first degree black belt in Shotokan Karate, and he is a certified level 4 Krav Maga instructor certified through the internationally recognized organization Krav Maga Force. Through his Krav Maga certification, Prillaman is recognized as a civilian Krav Maga instructor, a youth Krav Maga instructor, and is the chief instructor for the Krav Maga force women’s self defense program. Outside of the martial arts, Prillaman is a group fitness instructor, an avid yogi, a devoted husband, and a passionate carpenter and furniture fabricator.